If you’re looking for information and advice on benefits, social networks, health issues or support for carers, we can help. By simply offering you a variety of ways to access free advice and information, we’re making it easier for you to make the right choices about the care and support options available to you, helping you or your loved ones stay independent for longer. How can I find out about local support groups? What do I do if I have to go into hospital but I look after someone at home? How can I find a good home care agency close to where I live? My mum is showing signs of memory loss. What should I do? Prefer to talk to someone? Call the Adult Social Care helpline on 0300 200 1005. 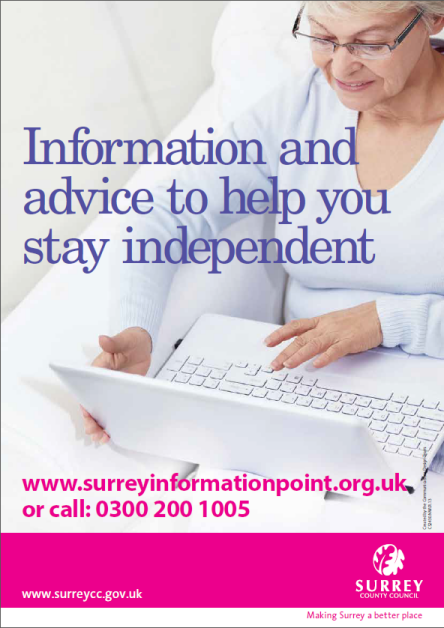 Our friendly advisors will be on-hand to provide free information and advice to all Surrey residents. They can also put you in touch with other relevant organisations or arrange for social care support if you’re eligible. 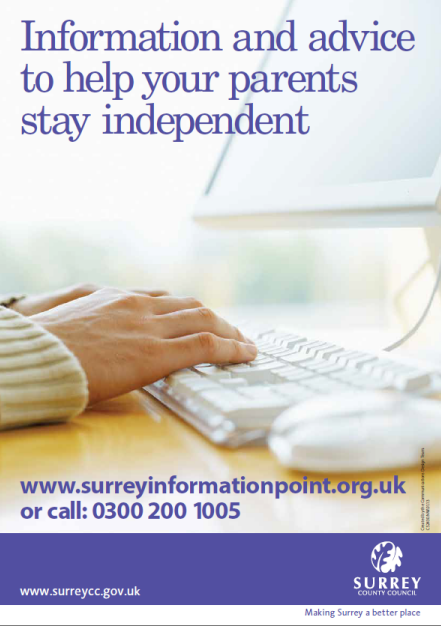 If you have access to the internet visit www.surreyinformationpoint.org.uk. This website is a free online directory, packed full of essential information to help you or people you care for, find reliable care, community and health information. Pop along to one of the Hub’s in Epsom, Redhill and Woking*. Each Hub is run by a group of volunteers who may have a disability or be a carer. These local centres will provide information and support to help disabled people, older people and carers stay independent. For more information visit www.surreyhubs.org.uk. * Coming soon... Hubs in Addlestone, Dorking and Godalming.